Sometimes God wakes us up – both literally and figuratively. Sometimes God wants a little extra amount of our attention given to him and to his plan so he wakes us up in the middle of the night. And we can’t get back to sleep. But it could be God. So my go-to solution for these sleepless nights (if the problem isn’t my stomach), is to pray and listen. I meditate on what God has been saying to me lately…and pray….and listen…and pray….and fall asleep. The next morning I often wake up with a new understanding about what God is doing or directions for the next step in his plan for my life. 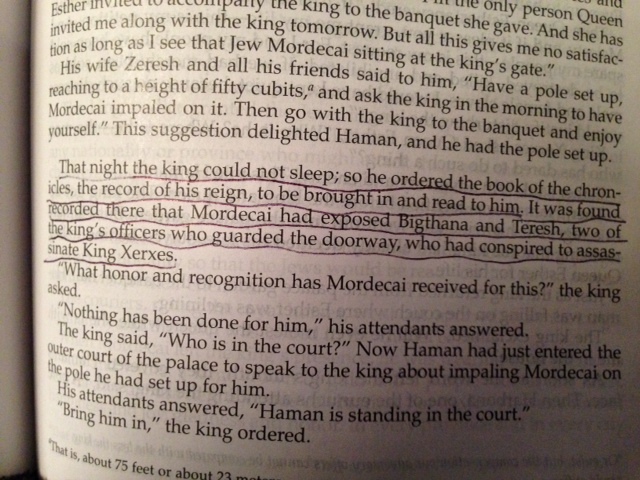 God did this same thing with King Xerxes and we read about it in the book of Esther. The king couldn’t sleep so he asked for the record of his reign to be read to him. (This sounds like a real snoozer!) And God reminded the king that nothing had been done to honor Mordecai who had exposed a conspiracy to assassinate the king. The king wanted to take care of this situation and so the plot of the story thickens. Has God woken you up lately? Try the ‘pray….. listen….meditate…..pray’ thing and let me know how it works. Thank you, dear Father, for the guidance you give us….in the middle of the night.